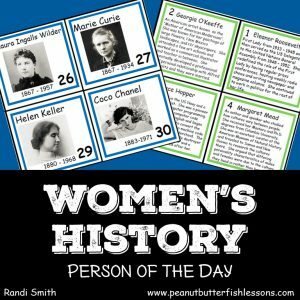 Helen Keller is an amazing woman to study because of the physical barriers she overcame in her life. At 19 months, she became seriously ill. When she recovered, she could no longer hear or see. Yet, she overcame these barriers and went on to graduate from a prestigious college, write books, give speeches around the world and spend much of her adult life helping others with disabilities. Her teacher, Anne Sullivan, played a vital role in Helen’s education and remained a lifelong companion. 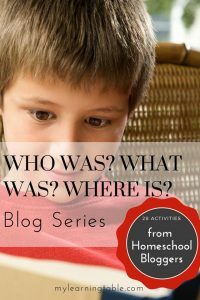 We learned this and much more when we read Who Was Helen Keller? 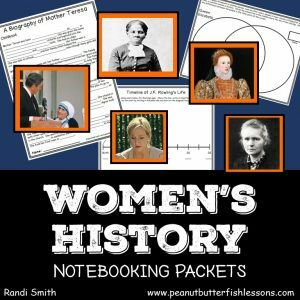 as part of our study of Women’s History. We completed fill-in the blank notebooking pages while we read, which can be downloaded below. We also had fun learning alternative ways to communicate such as sign language and Braille. It was sobering for all of us to imagine the challenges Helen faced by taking part in the activities below. 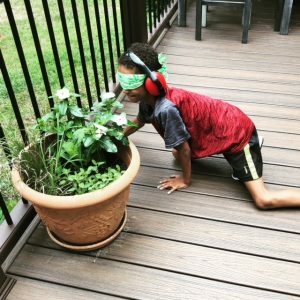 To try to understand what it was like for Helen to interact with the world around her, we blindfolded ourselves and put ear plugs in and tried to take part in a regular activity. First, we tried drawing pictures. Then, we attempted walking down the stairs to our backyard and walking around the backyard. The boys soon realized how difficult it was and it was interesting to see how each dealt with the challenge! 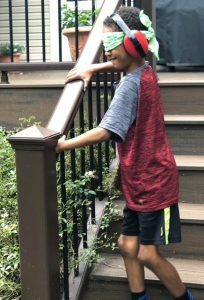 I also gathered a variety of objects in a bag and the boys had took turns feeling them while blindfolded and wearing plugs to see if they could tell what they were. They enjoyed this activity and did well. I stretched it by asking them to describe how they knew what the object was. Descriptive language and writing skills!! One of the first ways Anne taught Helen to communicate was by writing words on her hand. It was a little while before Helen understood what Anne was doing. We tried writing on each other’s hands to see if we would be able to understand what was being written. It was really hard! I don’t know how Helen learned to communicate this way with no prior knowledge of the alphabet! Helen never learned formal sign language since she was blind, but before Anne Sullivan became her teacher, she made up some of her own signs in an attempt to communicate with her family. 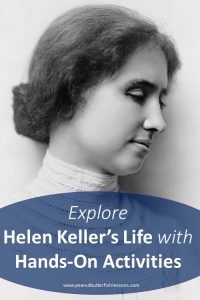 Learning sign language is a fun activity for children and adults and would be a great addition to a study of Helen Keller. Children could practice making up their own signs and then research how close they came to the actual sign for that word. You could also watch the videos below to learn some formal signs. Here is a video to teach you the alphabet in sign language. If you learn the alphabet, then you can spell any word you want. If you would like a printable chart of the alphabet, click here. Helen learned to write by using paper placed over a wooden writing board with grooves in it. She also learned to read Braille and was then able to read books on her own. We thought it would be fun to learn to read and write a little bit of Braille ourselves. I made a sentence in Braille for the boys to read. 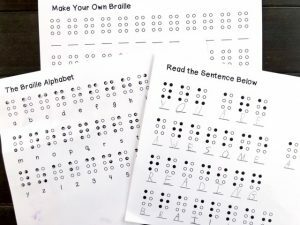 We used a Braille alphabet to decipher it and then punched holes in it so we could actually feel the Braille. The boys also came up with their own words and sentences for others to read. We plan on looking for Braille in the community as well. Elevators are usually a good place! You can replicate this activity at home with our FREE printable below. Subscribe to receive the unit study and our latest posts straight to your inbox. 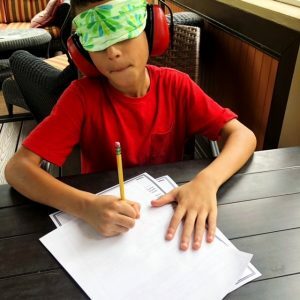 Overall, the boys enjoyed this hands-on study and gained a new appreciation for the difficulties Helen and others with disabilities have to overcome. To implement this unit study at home, give yourselves about 3-4 hours over the course of a week. Your children may really enjoy parts of it and want to spend even more time. The Miracle Worker: There are three different versions of this movie. The American Foundation for the Blind: Helen worked here in her later years. Learn more about Braille from BrailleWorks.